A repost of a piece I wrote three years ago, about a record I think is very special indeed. I listened to it today on my way home from work with my hood pulled up and the rain beating down on me, and it really did take me somewhere else. In July 1969, John Martyn was a folkie who’d put out two records on Island – London Conversations and The Tumbler – neither of which were anything remarkable in an era where Fairport Convention and Bert Jansch had already done much of their best work, redefining the forms that British folk music was capable of taking in the process (some of The Tumbler is actively embarrassing compared to, say, Fairport’s Genesis Hall). Beverley Martyn (nee Kutner), meanwhile, had fronted a jug band called the Levee Breakers, and put out a single written by Randy Newman (and featuring John Paul Jones, Jimmy Page, Nicky Hopkins and Andy White), with a Cat Stevens B-side. She’d played at Monterey Pop and been invited to the Bookends sessions by Paul Simon, where she contributed the immortal (spoken) words “Good morning, Mr Leitch, have you had a busy day?” to Fakin’ It. She was, in short, more of a “name” than her new husband and probably expected no more than yeoman musical support from John when they began work on what would become Stormbringer! in Woodstock in the summer of 1969 with engineer John Wood, drummers Levon Helm, Herbie Lovelle and Billy Mundi, bass player Harvey Brooks and pianist Paul Harris. Somehow or other – and opinions and recollections vary – the project morphed into a duo record, with John’s songs as well as Beverley’s being recorded. In no time, by sheer force of personality and pushiness, John’s voice became the dominant one; he wrote and sang six of the album’s ten tracks, and the album, when it came out, was credited to John and Beverley Martyn. It’s hard not to feel sympathy with Beverley for having been elbowed aside by her husband in this way, and the record’s producer, Joe Boyd, probably viewed the path that the record took with some regret, too; he seems not massively enamoured with John Martyn as a person, and not terribly impressed with him as a musician – “When John started living with Beverley Kutner, I was stuck with him”, he recalled in his 2006 memoir, White Bicycles. But by any reasonable assessment, John was much the greater talent (at least at that time – we can’t know what Beverley might have been capable of later in her career had she continued with it into the seventies), and Stormbringer! is a far greater record than a Beverley Martyn solo album with a bit of John’s guitar would have been. When I first heard this album, I was hugely excited to hear the coming-together of two of my very favourite players: Levon Helm, drummer/singer with the Band, and John Martyn himself, whose guitar playing I can honestly call life-changing. Yet Levon, magisterial as he is on John the Baptist, does not play on the album’s most indelible track, on which John’s guitar takes a backseat to the piano of Paul Harris, the sessions’ musical director. Stormbringer, the title track, features New York jazz player Herbie Lovelle on drums (who also played on another favourite of mine: Dylan’s version of Corrina Corrina from The Freewheelin’ Bob Dylan), and Lovelle could easily double for Helm here: same swinging semi-quaver bass drum, same easy but authoritative tom fills, same woody depth of sound. But Harris’s piano owns the song. His 16-bar solo, sounding like a more pastoral Richard Wright, may be the most beautiful passage on any John Martyn record; playing this graceful and empathetic is rare in any form of music. John Martyn would build a remarkable understanding with double bassist Danny Thompson over the course of half a dozen albums and many live gigs – and anyone who’s heard Fine Lines or Head and Heart knows what Thompson and Martyn could do together – but listening to Stormbringer, you can’t help but think wistfully of what Martyn and Harris might have done in a longer partnership, with perhaps Brooks and Lovelle as their permanent rhythm section. Any songwriter would kill to have a musician with them who so understands their songs that they can play with that kind of empathy. This entry was posted in Music and tagged Bert Jansch, Beverley Kutner, Beverley Martyn, Billy Mundi, Bookends, British folk-rock, Cat Stevens, Corrina Corrina, Danny Thompson, Fairport Convention, Fakin' It, Fine Lines, folk, folk music, folk revival, folk rock gets funky, folk--jazz, folk-rock, Genesis Hall, Harvey Brooks, Head and Heart, Herbie Lovelle, Joe Boyd, John & Beverley Martyn, John Martyn, John Wood, Levon Helm, London Conversations, Music, Paul Harris, Paul Simon, record production, records that sound great!, Richard Wright, The Freewheelin' Bob Dylan, The Tumbler, White Bicycles, Woodstock on October 17, 2016 by rossjpalmer. Beverley Martyn (nee Kutner), meanwhile, had fronted a jug band called the Levee Breakers, put out a single written by Randy Newman (and featuring John Paul Jones, Jimmy Page, Nicky Hopkins and Andy White), with a Cat Stevens B-side. She’d played at Monterey Pop and been invited to the Bookends sessions by Paul Simon, where she contributed the immortal (spoken) words ‘Good morning, Mr Leitch, have you had a busy day?’ to Fakin’ It. She was, in short, probably a bigger ‘name’ than her new husband and probably expected no more than yeoman musical support from John when they began work on what would become Stormbringer! in Woodstock in the summer of 1969 with engineer John Wood, drummers Levon Helm, Herbie Lovelle and Billy Mundi, bass player Harvey Brooks and pianist Paul Harris. 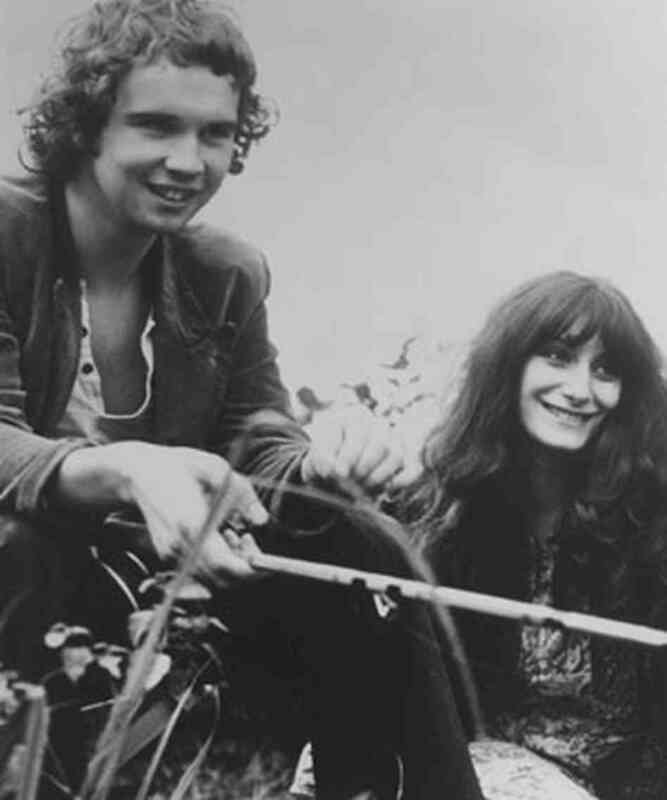 Somehow or other – and opinions and recollections vary – the project morphed into a duo record, with John’s songs as well as Beverley’s being recorded. In no time, by sheer force of personality and pushiness, John’s voice became the dominant one; he wrote and sang six of the album’s ten tracks, and the album, when it came out, was credited to ‘John and Beverley Martyn’. It’s hard not to feel sympathy with Beverley for having been elbowed aside by her husband in this way, and the record’s producer, Joe Boyd, probably viewed the path that the record took with some regret, too; he seems not massively enamoured with John Martyn as a person, and not terribly impressed with him as a musician – ‘When John started living with Beverley Kutner, I was stuck with him’ (White Bicycles, 2006). But by any reasonable assessment, John was much the greater talent (at least at that time – we can’t know what Beverley might have been capable of later in her career had she continued with it into the seventies), and Stormbringer! is a far greater record than a Beverley Martyn solo album with a bit of John’s guitar would have been. When I first heard this album, I was hugely excited to hear the coming-together of two of my very favourite players: Levon Helm, drummer/singer with the Band, and John Martyn himself, whose guitar playing I can honestly call life-changing. Yet Levon, magisterial as he is on John the Baptist, does not play on the album’s most indelible track, on which John’s guitar takes a backseat to the piano of Paul Harris, who was the sessions’ musical director. This entry was posted in Music and tagged Bert Jansch, Beverley Kutner, Beverley Martyn, Bob Dylan, Corrina Corrina, Danny Thompson, Electric Flag, Fairport Convention, Fine Lines, Genesis, Harvey Brooks, Head and Heart, Herbie Lovelle, Joe Boyd, John and Beverley Martyn, John Martyn, John Simon, John Wood, Levon Helm, Paul Harris, Road to Ruin, Stormbringer, The Band, The Freewheelin' Bob Dylan, Van Morrison, Woodstock on October 6, 2013 by rossjpalmer.